I could go on and on about how I love burgers and I love cheese stuffed burgers, and I’ve made blue cheese stuffed burgers a million times (check out blue cheese-stuffed beef burgers and blue cheese-stuffed turkey burgers for examples!). But I will spare you, because every time I make a cheese stuffed burger, I go on and on about it. I *will* say that I added leftover crumbled blue cheese to my salad last night for dinner, and my mother and two nieces all turned their noses up in disgust. Oh well, more for me, right?? 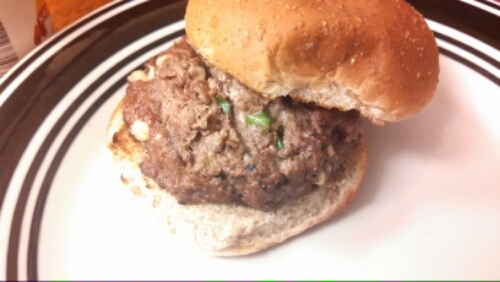 This blue cheese burger recipe comes from The Girl Who Ate Everything, which is a great cooking blog that you should check out if you haven’t already! I have found many recipes from her and have rarely (if ever) been disappointed! 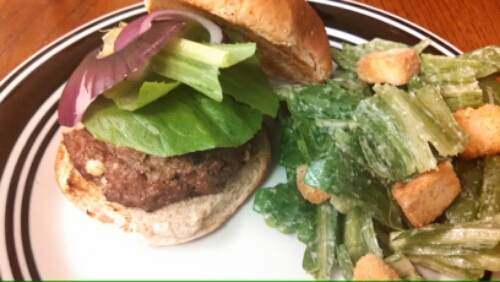 This burger recipe is actually different from all of the other cheese-stuffed burgers I’ve made before. In the other recipes, a piece (or a few pieces) of cheese is pushed into the center of the meat-ball, the meat is folded around the cheese, then formed into a burger (or some form of those directions). In this recipe, however, the blue cheese crumbles are combined into the meat mixture along with the other ingredients. I like trying my favourite standards a bit differently! My husband said he liked that the blue cheese was mixed into the entire burger, because he could taste more blue cheese in almost every bite. I liked that aspect too. Of course – you have to be a fan of blue cheese to enjoy that, because it definitely has a bite to it that does not suit everyone’s palate. Overall: DELICIOUS! In fact, you should grill these guys tonight! -Ia large bowl, mix the ground beef, blue cheese, green onions, Tabasco sauce, Worcestershire sauce, pepper, salt (I think I omitted the salt altogether – it truly doesn’t need it), and dry mustard. The original recipe says to chill the mixture for two hours, as this helps the patties keep their form, however I, as well as the original blogger, have done it without chilling and the patties were just fine. -Preheat grill to medium high heat and form meat mixture into 4 patties. Oil or spray the grill and cook the burgers for about 5 minutes per side or until done. Serve on hamburger buns with desired toppings and condiments.